The Drenec, completely refitted in 2012, is ideal for sailing Burma’s undiscovered coastal waters. 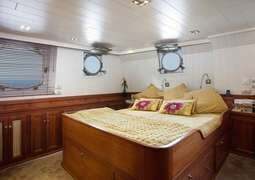 The Pandaw stateroom is the most celebrated feature of Pandaw ships. Finished in brass and teak, the 6 guest cabins are spacious and comfortable like hotel rooms. The Pandaw dining rooms are designed to open up along the sides and only at night they are closed and air conditioning is used. Attire is smart casual. Pandaw slippers are provided for your comfort on board the vessel. When ashore guests should use comfortable but safe walking shoes.